Safer Passing Laws are paramount to cyclists' safety. Besides advocating for better cycling facilities, the BC Cycling Coalition has partnered with members of the BC Road Safety Law Reforming Group in hopes of amending the Motor Vehicle Act for better road rules that protect and reduce on-road fatalities for cyclists. The Minimum Passing Distance Law -- also known as the MPDL -- has been introduced all over the world, including 28 states within the US. Several notable cities in Europe have paved the way for making biking the ultimate mode of transport, and down south, a strong "Share the Road" message was broadcasted primarily to improve cyclist safety. In Queensland, a report after a two-year trial of the Minimum Passing Distance rule enforced concluded that motorists' awareness of cyclists within one metre of their proximity has increased significantly. 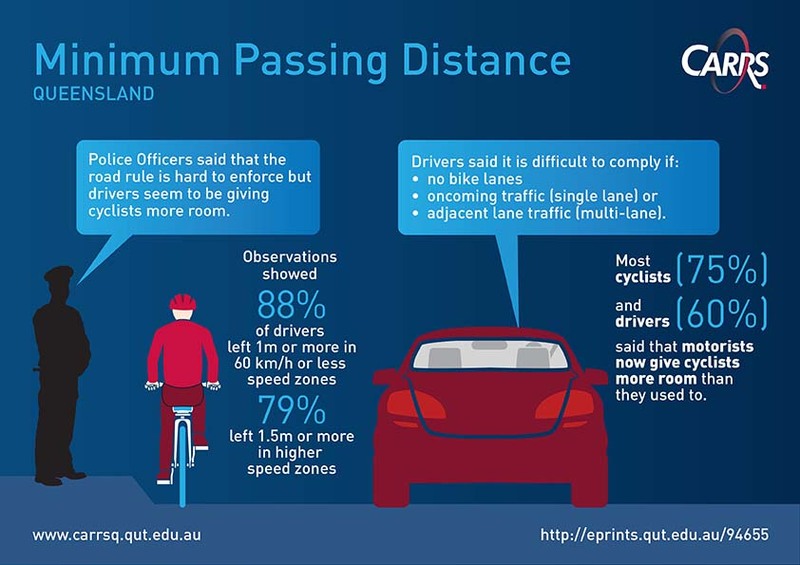 In fact, survey results from the QUT review show that 75% of cyclists and 60% of drivers believe that they can accurately judge a one-meter distance from passing drivers and cyclists even when traveling at 60 km/h. The BC Cycling Coalition wants British Columbians to be able to cycle and walk in safety. Our movement for the Active Transportation Strategy to be implemented provides facilities that will not only benefit the cycling community, but also our environment as we attempt to address climate change. Although British Columbia has undergone several strategies to provide greener public transportation, cycling should be of priority when it comes to designing suitable infrastructure for pedestrian, cyclists' and motorists' safety. We urge you now to take action now and write a letter to our government legislatures regarding this matter; highlight Queensland's two-year trial case to show what can be done. QPS officers stressed the challenge of enforcing the MPD road rule. The difficulty lied within assessing whether or not vehicles were following the rules as there was no concrete evidence to prove so. Carrs-Q reported, "the officers felt that this inability to accurately determine passing distances leads to erratic passing manoeuvres". Fortunately, since the enactment of the two-year trial, the QPS officers saw improvement in vehicle-bicycle interactions. Further suggestions to curtail ambiguity include conducting a series of road safety classes in the lead-up to the introduction of the road rule as well as in-class simulations of appropriate cycling passing distances and behaviour.